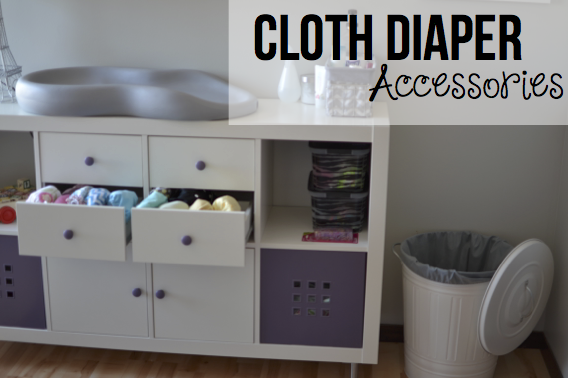 Most cloth diaper accessories are not necessary, but they sure do make cloth diapering easier. I know that I wouldn't attempt cloth diapering without most of these. Here are some things you might want to consider. Diaper Pail - Whether you use disposables or cloth you are going to need somewhere to store those dirty diapers. You can pretty much buy any container you wish, but remember to buy one that is big enough. You will probably doing laundry every 1-3 days and a newborn can easily go through 12 diapers in a day. I use an 11 gallon IKEA Knodd trash can with the lid off. It may seem counter intuitive, but I find the air circulation seems to help the smell. 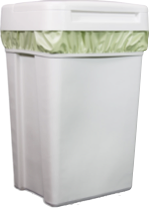 Diaper Pail Liner - A reusable waterproof pail liner for your diaper pail. It has PUL on the inside and fabric on the outside. When it is laundry day I simply lift the liner out of the pail, dump the contents into the washing machine, throw in the pail liner, and wash everything at once. I would recommend buying two so you always have one for your dirty diapers while the other is in the wash. Wet Bags - It is essential to have somewhere to put dirty diapers when out and about, hence wetbags. They are basically tiny pail liners that zip closed, and come in all kinds of fun patterns and colors. I love the Planet Wise brand. They hold in the stink well and I do not have to worry about everyone I pass is getting a whiff of Grace's diapers. I have 2 medium bags (holds 6-9 diapers) for everyday outings and a large bag (holds 14-17 diapers) for when we travel overnight. They can also be machine washable and again I recommend getting multiples for when one or two are being washed. BONUS, they work great for holding wet swimsuits and towels or soiled clothing too. Extra Inserts - If you are using pocket diapers or AI2's your diapers most likely already came with a couple inserts. Those may work great for the first couple months, but I am going to warn you now that you will end up buying more or different ones as your child grows. Often times the inserts that come with pockets are microfiber which is notorious for being bulky, stinky and not all that absorbent. Over time you will likely look for more absorbent and trimmer materials like bamboo and hemp, but we will discuss those later. 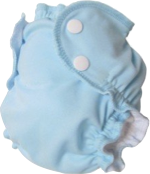 Diaper Covers - When using one of the non-waterproof diapers (flat, prefold, contour, or fitted) you need to put a waterproof cover over them. Most of these covers will be made from PUL and come in sized or one-size varieties, and in snap or hook and loop closures. There are also wool covers, but I have yet to tackle those. 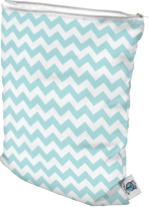 My personal favorite are the Thirsties x-small for newborns and the Thirsties Duo Wrap for older kids. 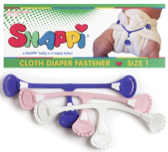 Snappi - Prefolds, flats, contours and some fitted come without fasteners attached. In order to keep the diaper on underneath the diaper cover I recommend these. They have small plastic teeth that grabs the fabric and are so quick and easy to use. No need for diaper pins anymore. Diaper Sprayer - Once your child starts solids or if they are formula fed you may want to think about getting a diaper sprayer. For some sprayers are a luxury, but if you ask me they are essential. It ensures that I keep my hands clean when dealing with poopy diapers. 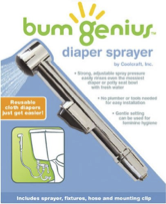 You also do not need to buy an expensive sprayer that is marked for cloth diaper use. We bought a simple kitchen sprayer and hooked it to our toilet. According to my husband it was a simple install, but I have a feeling he had a chat with some of the workers at the hardware store first. 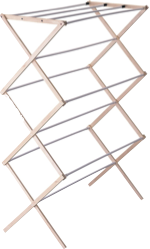 Drying Rack - Again this is not essential, but helpful. PUL shouldn't in the dryer, as heat may damage the waterproofing over time. When my diapers are clean I transfer my covers, shells, wetbags, and liners onto the drying rack and throw everything else in the dryer. Another use for the drying rack is stain removal. That's right. Occasionally, I will place my drying rack full of diapers outside. The sun bleaches the stains without chemicals. How cool is that? 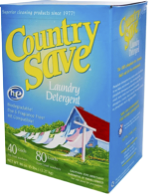 Laundry Detergent - When it comes to washing your diapers the average grocery story detergent will not work, as they can cause build up which will make your diapers repel moisture. Instead you need a low suds detergent that is free of enzymes, optical brighteners, dyes, fragrances, bleach, and softeners. The Diaper Jungle and Pinstripes and Polkadots both have great charts that compare a lot of the detergents on the market today and show which are safe to use with cloth diapers. Diaper Cream - One of the perks of using cloth diapers is that diaper rash is less common. However, they still happen on occasion. Many of the popular diaper rash creams coat the interior of the diapers, making them repel moisture and leak. The good news is that there are a lot of cloth diaper safe creams on the market today, and most of them work great, my favorites are CJ's Butter and The Honest Co. Healing Balm . However, you don't need to buy expensive creams as regular coconut oil works great and is cloth diaper safe. 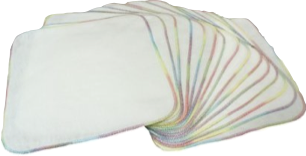 Liners - Diaper liners are thin disposable sheets that you can line your diapers with to make clean up easier. You really don't need disposable liners, but some moms like to use them when they leave the house. They also come in very handy if you have to use a diaper cream that is not cloth diaper safe, such as a prescription from the doctor. Swim Diaper - If you plan on taking your little one swimming, you may want to think about investing in a reusable swim diaper. 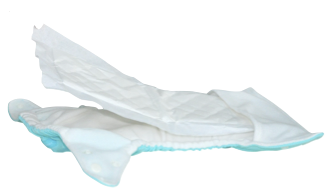 They are similar to cloth diapers, but without the absorbent materials or waterproofing. They function only to keep solids contained. They work so well that some pools actually require babies to wear cloth instead of disposable swim diapers, I know ours does. My favorite swim diapers are made by AppleCheeks and have snaps on both sides, so that you do not have to try and slide a messy diaper down the legs in order to take it off. TIP: No swim diaper, whether cloth or disposable holds pee, so make sure you only put it on right before you get in the pool.